On my last day in Melbourne, I really felt like I needed a bit of health kick and I wanted to start my day off right. I had walked past this cool looking juice store a couple of times over on Collins Street, so first thing in the morning I made a beeline for the Pressed Juices store. 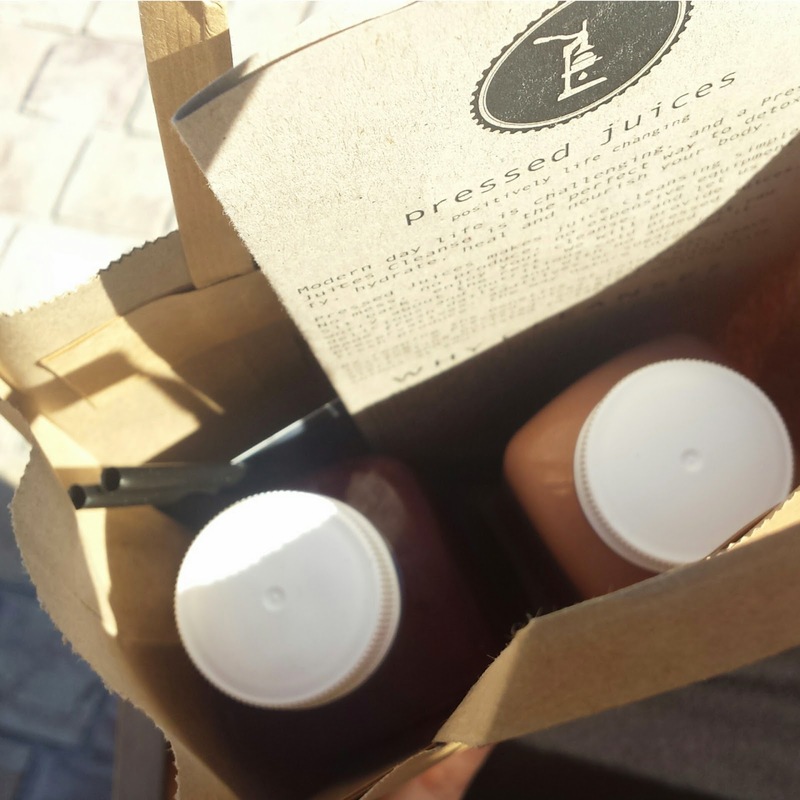 Pressed juices specialize in juices (but also make amazing looking salads and breakfast packs!) and offer heaps of information and tips for juice cleanses. 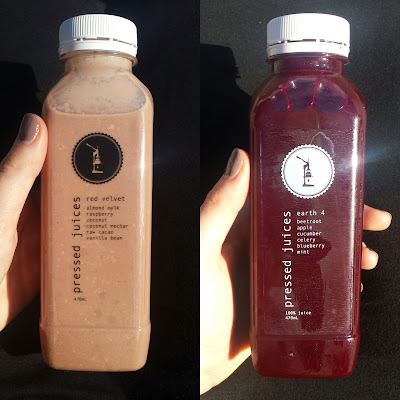 Obviously I wasn't about to embark on a 5 day juice cleanse (or even a 1 day juice cleanse) so I just chose two bottles from their expansive range for my breakfast. It was such a hard choice because they were all beautifully displayed in, like, the most appealing juice-filled-fridge-layout I've ever seen. Then I walked to Federation Square with my little bag of goodies to sit in one of the deck chairs and enjoy them in the sunshine. I went with Earth 4 to drink as a refreshing thirst quencher, and then I chose Red Velvet for its smoothie like consistency as my 'solid' breakfasty drink to fill me up. Good to know: Their juice hasn't been pasteurized and has no preservatives or sweeteners so you know that what you're drinking is, like, the elixir of life or something. 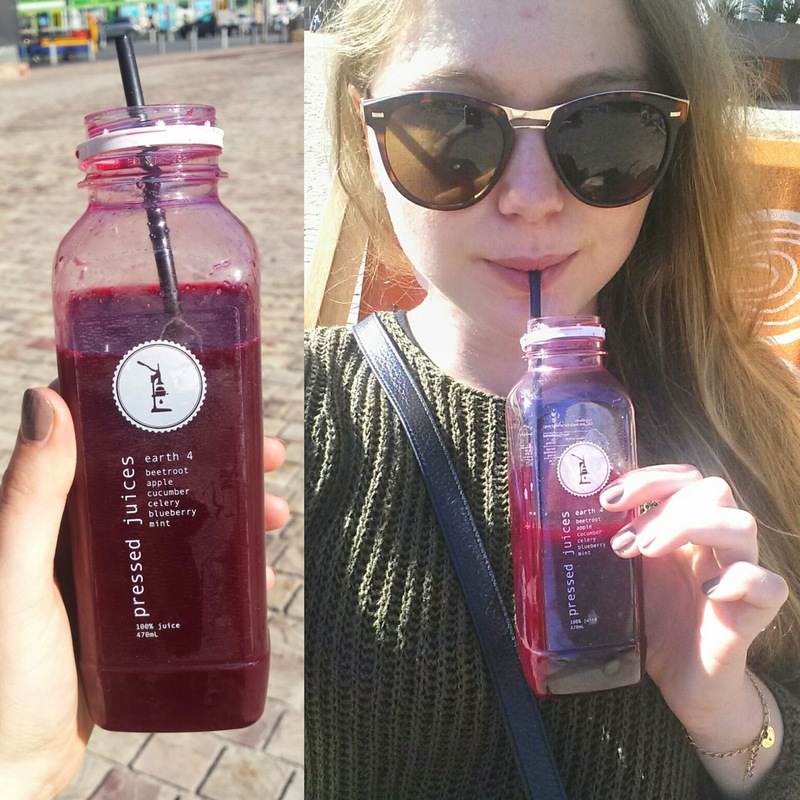 This was my favourite of the two, purely because I am such a beetroot juice girl! Check them out on Instagram if you're feeling thirsty and on their website to read more about cleanses and to browse their entire menu online before you go instore!